(lenz), [TA] Avoid the misspelling lense. 1. A transparent material with one or both surfaces having a concave or convex curve; acts on electromagnetic energy to cause convergence or divergence of light rays. 1. a piece of glass or other transparent material so shaped as to converge or scatter light rays; see also glasses. 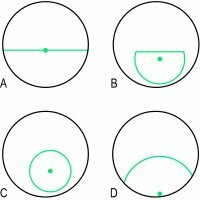 Lenses: (A–F), Spherical lenses: (A), biconvex; (B), biconcave; (C), planoconvex; (D), planoconcave; (E), concavoconvex, periscopic convex, converging meniscus; (F), convexoconcave, periscopic concave, diverging meniscus; (G, H), cylindrical lenses, concave and convex. 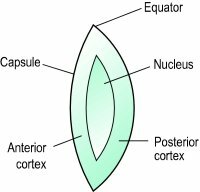 2. crystalline l.; the transparent, biconvex body separating the posterior chamber and vitreous body, and constituting part of the refracting mechanism of the eye. achromatic lens one corrected for chromatic aberration. aplanatic lens one for correcting spherical aberrations. bandage lens a soft contact lens worn on a diseased or injured cornea to protect or treat it. bifocal lens one with two parts of different refracting powers, the upper for distant and the lower for near vision. concavoconvex lens one with one concave and one convex face. contact lens a curved shell of glass or plastic applied directly over the globe or cornea to correct refractive errors. It may be a soft (hydrophilic) contact l., flexible and water absorbent, or a hard (hydrophobic) contact l., rigid and not water absorbent; the latter type is subdivided into gas permeable and non–gas permeable, usually polymethylmethacrylate (PMMA), lenses. convexoconcave lens one with one convex and one concave face. cylindrical lens one for correcting astigmatism, with one plane surface and one cylindrical, or one spherical surface and one toroidal. Symbol C.
decentered lens one whose optical axis does not pass through the center. honeybee lens a magnifying lens resembling the multifaceted eye of the honeybee, consisting of three or six small telescopes mounted in the upper part of the lens and directed toward the center and right and left visual fields. Prisms are included to provide a continuous, unbroken magnified field of view. omnifocal lens one whose power increases continuously and regularly in a downward direction, avoiding the discontinuity of bifocal and trifocal lenses. spherical lens (S) (sph) one that is a segment of a sphere. trial lens one used to test vision. trifocal lens one with three parts of different refracting powers, the upper for distant, the middle for intermediate, and the lower for near vision. 1. A ground or molded piece of glass, plastic, or other transparent material with opposite surfaces either or both of which are curved, by means of which light rays are refracted so that they converge or diverge to form an image. 2. A combination of two or more such pieces, sometimes with other optical devices such as prisms, used to form an image for viewing or photographing. Also called compound lens. 3. A thin piece of glass or plastic, as on a pair of sunglasses, that transmits light without refraction. a. A transparent, biconvex structure in the eye of a vertebrate or cephalopod that is located between the iris and the vitreous humor and focuses light rays entering through the pupil to form an image on the retina. b. A similar structure in many invertebrates. 1 a curved transparent piece of plastic or glass that is shaped, molded, or ground to refract light in a specific way, as in eyeglasses, microscopes, or cameras. the crystalline lens of the eye. See crystalline lens. lenticular, adj. 2. [TA] The transparent biconvex cellular refractive structure lying between the iris and the vitreous humor, consisting of a soft outer part (cortex) with a denser part (nucleus), and surrounded by a basement membrane (capsule); the anterior surface has a cuboidal epithelium, and at the equator the cells elongate to become lens fibers. A regular transparent solid having convex or concave surfaces such that incident beams of light are bent so as to converge (convex lenses) or diverge (concave lenses). The CORNEA is the main light-bending lens of the eye. The internal CRYSTALLINE LENS effects fine adjustments to the focus by an alteration of curvature. Fixed lenses are used in spectacles or in contact with the corneas to correct inherent errors of eye focusing. a transparent body at the front of the vertebrate eye, the main function of which is ACCOMMODATION and not refraction, though the latter does take place. an optical glass shaped to refract rays of light, used, for example, in the eyepiece and objective of the microscope. The transparent, elastic, curved structure behind the iris (colored part of the eye) that helps focus light on the retina. A piece of transparent glass, crystal, plastic or similar substance (e.g. liquid) having two opposite regular surfaces which can be plane or curved and which alter the vergence of pencils of light transmitted through it. There are many types of lenses, which are described below. See coquille; glass; moulding; surfacing. absorptive lens A lens that absorbs a proportion of the incident radiation. Some lenses absorb mostly in the infrared region of the spectrum, others absorb mostly in the ultraviolet region and others absorb more or less equally throughout the visible spectrum. See CR-39; filter; coated lens; pterygium. achromatic lens A compound lens designed to reduce or eliminate chromatic aberration. The most common type is called a doublet. Syn. achromat. See apochromatic lens; hyper-chromatic lens. achromatizing lens Lens aimed at reducing or eliminating the chromatic aberration of the eye. It consists of either a doublet or a triplet that possesses longitudinal chromatic aberration opposite to that of the eye and thereby neutralizes it. Thus the lens system has negative power for short wavelengths and positive power for long wavelengths of an amount similar to that of the eye for those wavelengths. lens adherence 1. Refers to a contact lens being firmly fixed to the cornea. 2. Attachment of bacteria (e.g. pseudomonas, staphylococcus) to a contact lens, particularly soft lens materials (the amount and strength vary with the material). Syn. lens binding. See silicone hydrogel lens; tear stasis. afocal lens A lens of zero power (Fig. L7). Syn. plano lens. See aniseikonic lens. Alvarez lens A variable power lens composed of two elements that can be moved with respect to each other along two mutually perpendicular axes. When the two lenses are in exact register with each other the Alvarez lens provides zero power. Moving one of the elements either laterally or vertically in relation to the other provides increasing spherical or cylindrical power. Moving both elements produces a combined spherocylindrical power. Such a lens is used in the Humphrey Vision Analyser. anastigmatic lens 1. A lens that has a single focal point. 2. A lens that is corrected for oblique astigmatism and minimum curvature of field. Syn. stigmatic lens. See astigmatic lens; Petzval surface. aniseikonic lens Lens designed to correct aniseikonia. It can have power like a regular ophthalmic lens but also produces a magnification of the image. A lens which only produces magnification but has zero power is called an overall size lens and if it magnifies in only one meridian it is called a meridional size lens. Syn. iseikonic lens; eikonic lens; size lens. See afocal lens; shape magnification. anterior chamber intraocular lens See intraocular lens. anti-actinic lens A lens that absorbs ultraviolet radiations to a much greater extent than a white spectacle lens. See actinic. anti-reflection coated lens See coated lens. aphakic lens A lens used for the correction of aphakia. It is of high dioptric power, usually above +10 D. Due to their thickness, these lenses are usually made of plastic to reduce weight and because of the aberrations, aspherical surfaces are used. See lenticular lens; jack-in-the-box phenomenon. aplanatic lens A lens designed to correct for spherical aberration and coma. apochromatic lens A compound lens designed to correct chromatic and spherical aberrations. It uses three or more kinds of glass. This lens corrects chromatic aberration more thoroughly than an achromatic lens. See achromatic lens. aspheric lens A lens in which one or both surfaces are not spherical, so designed to minimize certain optical aberrations. astigmatic lens A toric or cylindrical lens that produces two separate focal lines at right angles, instead of a single focal point. Hence it has two principal powers. One of these powers may be zero (cylindrical lens). See cylinder axis; anastigmatic lens; spherocylindrical lens; protractor; interval of Sturm; transposition. back toric contact lens A contact lens used to correct corneal astigmatism in which the surface of the lens facing the cornea is not spherical but toroidal in order to obtain a good physical fit on the cornea. To create better stability of the lens on the eye it usually incorporates a prism ballast. See ballast. Bagolini's lens See Bagolini's glass. balancing lens A lens fitted to a spectacle frame or mount, to balance the weight of the other lens, its power being unspecified or unimportant. bandage lens See therapeutic contact lens. bent lens See meniscus lens. best-form lens A curved lens whose curvatures are calculated to eliminate or minimize aberrations when viewing through the peripheral portions of the lens. Syn. corrected lens; point-focal lens. See Tscherning ellipse. biconcave lens A lens that has two concave surfaces. biconvex lens A lens that has two convex surfaces. bifocal lens A lens having two portions of different focal power. Usually the upper portion is larger and is used for distance vision while the lower portion is smaller and used for near vision. There are, however, many types of bifocals: those in which the use of the two portions is the opposite of that described above, others in which the shape of the near portion (or segment) differs; in certain types the near segment is fused onto the surface of the glass (fused bifocal); in others the near portion is produced by grinding or moulding a different curvature on one surface (solid bifocal or one-piece bifocal). There is also a one-piece bifocal in which there is a gradual transitional zone between the two portions instead of a clear line of demarcation (blended bifocal). In addition, several other bifocals are known by their trade name (Fig. L8). See button; jump; progressive lens; monocentric; segment height; segment of a bifocal lens; wafer. lens binding See lens adherence. biomimetic contact lens A hydrogel contact lens made up of a material that imitates the chemistry of natural cell membranes to minimize changes in ocular physiology. lens blank A moulded piece of ophthalmic glass before completion of the surfacing processes. See glass; semi-finished lens. lens capsule See capsule; crystalline lens. lens carrier See lenticular lens; bioptic telescope. cast-moulding contact lens A contact lens produced by pressing a concave female mould filled with liquid monomer against a male mould. The concave mould determines the front surface of the lens. The edge is formed when the two sides of the mould come together. The assembled moulds are irradiated with ultraviolet light to cause polymerization and a dry contact lens, which is then hydrated in saline water. Cast-moulding has been used to manufacture hard and soft lenses, especially mass production of the latter. See lathe-cut contact lens; spin-cast contact lens. Chavasse lens A lens with an irregular surface used to depress the visual acuity while permitting the eye to be seen from the front (British Standard). ChromaGen lens Trade name of a tinted, soft contact lens worn with the aim of enhancing colour perception in individuals with colour vision deficiencies, especially red-green defects. It is fitted on either one or both eyes. The lenses exist in a variety of tints and are chosen by the patient by trial and error. Some patients with dyslexia or migraine have also claimed to benefit from wearing these lenses. See X-Chrom lens. lens clock See lens measure. coated lens A lens upon which is deposited an evaporated film consisting of a metallic salt such as magnesium fluoride, about one-quarter as thick as a wavelength of light. This film reduces, by interference, the amount of light reflected by the surfaces and to some extent the amount of stray light reflected inside the lens. With multilayer coating the lens can selectively reflect radiations and increase transmission. All coated lenses show some residual colour. Syn. anti-reflection (AR) coated lens; bloomed lens. See anti-reflection coating; coating; ghost image. cobalt lens A lens that absorbs the central region of the visible spectrum and only transmits the red and blue ends of the spectrum. It is sometimes used in the testing of ametropia, since a light source located at 1.4 m from the eye will form, in an emmetropic eye viewing it through a cobalt lens, two equal circles superimposed on the retina and the subject will report seeing a purple circle. A hyperope will see a blue spot surrounded by a red annulus and a myope will see a red spot surrounded by a blue annulus. An appropriate spherical lens placed in front of the eye, which changes the appearance to a purple circle, represents the spherical refractive correction. Syn. cobalt-blue glass. See duochrome test. combination lens A lens made from two different materials; usually a rigid centre portion made from gas-permeable material surrounded by a soft peripheral flange of HEMA material. It is used in the management of keratoconus, irregular astigmatism, etc. Few such lenses exist at present. See piggyback lens. composite lens A contact lens composed of two or more different materials. compound lens 1. A lens that functions as a combination of a spherical lens and a cylindrical lens. Example: a spherocylindrical lens. 2. A system composed of several refracting surfaces or lenses placed along the same axis. Examples: doublet; triplet. See spherocylindrical lens. concave lens A lens that causes incident rays of light to diverge. Syn. diverging lens; minus lens; negative lens. contact lens A small lens usually made of a plastic material, worn in contact with the cornea or sclera and used to correct refractive errors of the eye. There are many types of contact lenses. Lenses that rest on the sclera are called scleral (or haptic) contact lenses whereas lenses that rest on the cornea are called corneal contact lenses, or, more commonly, contact lenses. Lenses that are made of a hard plastic material which is impermeable to oxygen, such as those made of polymethyl methacrylate (PMMA), are called rigid contact lenses. Almost all rigid contact lenses nowadays transmit oxygen. They are called gas permeable contact lenses (GP, GPL, GPCL, HGP or RGP), or merely rigid contact lenses and they usually contain silicone acrylate or fluorosilicone acrylate.Other lenses made of a soft plastic material which transmit a certain amount of oxygen are called soft (or hydrophilic or hydrogel or gel or flexible) contact lenses (SCL) whose water content varies; the greater the water content the more oxygen is transmitted (for equal thickness). Very high water content lenses are used for extended wear (EW). There are also bifocal contact lenses consisting of two segments with different focal powers, which provide either simultaneous vision (light from both the distance and near portions enters the eye at the same time) or alternating vision (the lens must be moved to see through either portion). Other bifocal contact lenses have a zone of variable power between the two portions and others are diffractive in which light from both distance and near objects can be focused on the retina (without moving the lens) owing to diffraction produced by a series of rings in the centre of the back surface of the lens (the higher the near addition the greater the number of rings). There are also toric contact lenses in which the back optic surface is toroidal; they are used to improve the physical fit. Bitoric contact lenses are lenses in which both surfaces are toroidal; they are used to improve the physical fit and correct the induced astigmatism. Disposable contact lenses are worn for one day, one week, two weeks on a daily basis, a month and then discarded. See acidosis; hypercapnia; lens adherence; back toric contact lens; biomimetic contact lens; cast-moulding lens; ChromaGen lens; cosmetic contact lens; extended wear lens; fenestrated lens; flare lens; flat lens; flexure lens; lathe-cut contact lens; liquid lens; ortho-k lens; piggyback lens; reverse-geometry contact lens; scleral contact lens; sealed scleral contact lens; silicone hydrogel lens; spin-cast contact lens; steep lens; therapeutic contact lens; X-Chrom lens; modulus of elasticity; oxygen permeability; water content. contact lens deposits See contact lens deposits. converging lens See convex lens. convex lens A lens that causes incident rays of light to converge. Syn. convex lens; plus lens; positive lens. corrected lens See best-form lens. lens cortex See crystalline lens. cosmetic contact lens A contact lens designed to improve the appearance of the eye, to conceal a disfigurement (e.g. a scar), or to change the colour of the eye. Examples: a tinted lens; an opaque lens with an artificial pupil and iris. See aniridia. cross-cylinder lens An astigmatic lens consisting of a minus cylinder ground on one side and a plus cylinder ground on the other side, the two axes being located 90º apart. The dioptric power in the principal meridians is equal. Usual cross-cylinder lenses are provided in three powers: ±0.25 D, ±0.37 D and ±0.50 D (higher values are also available for use with low vision patients). This lens is used in the subjective measurement of the power and axis of astigmatism, or to refine the cylindrical correction determined otherwise (Fig. L9). Syn. Jackson cross-cylinder lens. See cross-cylinder test for astigmatism. crystalline lens The biconvex, usually transparent body situated between the iris and the vitreous body of the eye and suspended from the ciliary body by the zonular fibres (zonule of Zinn), which are attached to the equator of the lens. The diameter of the lens is equal to 9-10 mm and its thickness 3.6 mm, being greater when the eye accommodates. The radii of curvature of the anterior and posterior surfaces are 10.6 mm and −6.2 mm, respectively in the unaccommodated eye, while maximum accommodation alters these values to about 6 mm and −5.3 mm respectively. The crystalline lens displays a complex gradient of refractive index (averaging 1.42), and a power of 21 D. It consists of the capsule which envelops the lens, the epithelium which consists of a single sheet of cells and lines the anterior and equatorial capsule and the cortex which surrounds the nucleus, the latter two containing the lens fibres. The lens has the highest protein content of any other tissue in the body. The most numerous proteins in the lens are the soluble proteins dominated by the crystallins followed by the insoluble proteins especially cytoskeletal proteins. With age, there is an increase in light scatter originating in the nucleus, as well as some light absorption and yellowing of the nucleus (Fig. L10). Syn. lens of the eye. See constants of the eye; Wilson's disease; lens fibres; optic fissure; intraocular lens; lens paradox; lens sutures; luxation; lenticular myopia; phakic; shagreen; zonule of Zinn. curved lens See meniscus lens. cylindrical lens A lens in which one of the principal meridians has zero refractive power. It usually consists of one plano surface and one cylindrical surface (Fig. L11). See astigmatic lens. lens dislocation See luxation of the lens. disposable lens See contact lens. diverging lens See concave lens. eikonic lens See aniseikonic lens. equi-concave lens A lens having two concave surfaces of the same power. equi-convex lens A lens having two convex surfaces of the same power. equivalent lens See spherical equivalent. lens exfoliation See exfoliation of the lens. extended wear lens A contact lens designed to be worn continuously for more than one day and, usually, no more than seven days before cleaning and sterilization. It is, typically, a soft lens, with high oxygen transmissibility. See cornea guttata; corneal infiltrates; silicone hydrogel lens; epithelial microcysts; specular microscope; pannus; corneal ulcer. lens extraction See cataract extraction. fenestrated lens A hard contact lens having one or more small holes to aid tear exchange and corneal oxygenation. It was essential with PMMA scleral contact lenses, but with the advent of gas permeable materials, fenestration is rarely necessary. Syn. ventilated lens. finished lens A spectacle lens that has been surfaced on both sides to the required power and thickness and is still in uncut form. syn. uncut lens. See semi-finished lens; surfacing. fisheye lens A camera lens with a very wide angle of view. The angle can be as wide as 220º. To achieve this the lens has a large diameter that produces image distortion (especially barrel-shaped distortion); thus the image magnification varies across the picture causing some fishbowl effects. See wide-angle lens. lens flare Type of blur characterized by the presence of a secondary or ghost image. Flare may be caused by a contact lens with an optic zone diameter that is smaller than the pupil diameter or when the lens decentres so that part of the edge of the optic zone is within the pupil area. 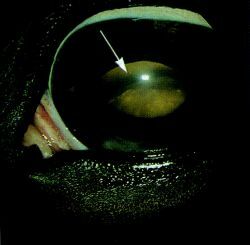 Flare is usually more apparent under conditions of reduced illumination as the pupil is larger. Management consists in refitting the patient with a lens with a larger optic zone diameter or with better centration. See ghost image. flat lens 1. Any lens that is not of curved form. 2. A contact lens in which the back optic zone radius is longer than the flattest meridian of the cornea. This definition may not be valid for a soft lens that may have a back optic zone radius longer than the flattest meridian of the cornea and yet not be flat fitting. Syn. loose lens (it is preferable to use this term for soft lenses). See fitted on K; steep lens. lens flexure Characteristic of a spherical contact lens to adopt a toroidal curvature when placed on an astigmatic cornea. Flexure depends upon the material and its thickness, being more common with thin lenses. As it occurs during blinking, it sometimes results in fluctuating vision. lens flippers Two pairs of lenses mounted on a central bar, one pair on each side. One pair can be held in front of the patient's eyes and then quickly changed for the other pair by twisting the bar extension handle. The lenses may be one pair of minus lenses of equal power and the other pair of plus lenses of equal power. The most common pairs are ±2.00 D, although ±1.00 D, ±1.50 D and ±2.50 D are also available. These are used in the testing and training of accommodative facility. Prisms may also be used, as for example base-in for one pair and base-out for the other. They are used in the testing and training of vergence facility (Fig. L12). Syn. flippers; flipper bar; flip lenses; flip prisms; prism flippers. Fresnel lens A plastic lens consisting of one flat surface which can adhere to a clean lens surface and another surface on which there is a series of concentric prismatic rings or elements. The same focusing effect can be obtained in an optical element if the lens surface is divided into small elements and these elements are brought together in a common plane normal to the optical axis. The apical angles of these prismatic elements increase ring by ring towards the lens periphery. Thus, the Fresnel lens has the same power as a continuous spherical lens surface but without the thickness and the weight. However, owing to the imperfect surface of the lens a slight reduction in acuity is obtained. These lenses are primarily used for temporary correction in orthoptics therapy, or following eye surgery and as condensers in overhead projectors, headlights, etc. Fresnel lenses are also made in vinyl material called Fresnel Press-On lenses, which can adhere to a standard lens surface. (Fig. L13) See Fresnel Press-On prism. frosted lens A lens made translucent by having one or both surfaces smoothed but not polished. See ground glass; surfacing; translucent. Goldmann three mirror lens See gonioscope; slit-lamp. gonioscopic lens A lens placed in contact with the cornea for the purpose of viewing the angle of the anterior chamber. It may be a prismatic lens or a lens with mirrors, or merely a thick convex contact lens. Some, like the Goldmann three-mirror goniolens, enable visualization with a slit-lamp of the ciliary body and peripheral retina, as well as the angle of the anterior chamber. Other gonioscopic lenses (e.g. Zeiss) have four mirrors. Syn. goniolens. See biomicroscope; indirect gonioscopy; Koeppe lens; Zeiss lens. gradient-index lens A lens with an index of refraction that changes continuously through the whole material, or part of, thus providing an area of progressive power. However, there are still problems in manufacturing these lenses reliably and without unwanted astigmatism. See progressive lens. lens groove An indentation on the edge of a lens designed to accommodate a cord (usually a nylon thread), which retains the lens in a rimless mounting. See rimless fitting; rimless spectacles; supra spectacles. high index lens A specialized lens made with higher refractive material than crown glass. Included in these are flint and titanium glass in which the refractive index can be as high as 1.8. However, as the index increases there is usually a decrease in the constringence. For example, Zenlite (a trade name) has a refractive index of 1.805 and a constringence of 25.4. Recently, technical advances have made it possible to manufacture high index progressive lenses. High index lenses are used for high prescriptions, as they can be made much thinner than crown glass lenses of equivalent power. As high index lenses have very reflective surfaces it is valuable to have them coated. high water content lens A contact lens whose water content is greater than 50%. honey bee lens A compound magnifying lens consisting of three to six small telescopes mounted in the upper portion of a spectacle lens. The telescopes are so arranged as to resemble the multifaceted eye of the honey bee. They have their axes converging on the eye as well as prismatic objectives to provide an approximately continuous field of view. Hruby lens A spherical diverging lens of −55 D mounted on a slit-lamp and biomicroscope in such a way that it can be placed very close to the patient's cornea. It is used, coupled with the microscope, to examine internal ocular structures including the retina. hydrogel lens See contact lens; silicone hydrogel lens. hyperchromatic lens A compound lens designed to have a large amount of chromatic aberration. It may be of use in the correction of presbyopia by extending the depth of focus of the eye; the eye receives a clear red image of distant objects and a clear blue image of near objects without having to change its focus. However, because of the reduced information in the retinal image, such a lens would be more beneficial with high contrast objects. See achromatic lens. immersion lens Objective of a high power microscope in which the space between its front lens and the cover plate of the microscope slide is filled with an immersion liquid, e.g. water, cedar wood oil, etc. lens implant See lens intraocular. intraocular lens (IOL) A lens inserted in the eye to replace the crystalline lens after cataract surgery. To obtain the correct lens power it is necessary to measure corneal curvature and axial length of the eye. Several formulae exist to arrive at the power of the intraocular lens. Intraocular lenses are mostly made of silicone or acrylic (propenoic acid) and can be easily folded to be inserted into the eye through a very small opening. There are many types, including monofocal and multifocal ones. Accommodative intraocular lenses are monofocal lenses which are moved by the ciliary muscle, thus providing clear focus at a range of distances. Anterior chamber intraocular lenses (ACIOL) are placed anterior to the iris. Fitting is usually carried out following intracapsular cataract extraction. Posterior chamber intraocular lenses (PCIOL) are placed within the capsular bag or less commonly anchored into the ciliary sulcus. The lens can be folded and inserted into the eye through a very small opening made during phacoemulsification. A PCIOL can also be inserted through a larger incision made during extracapsular cataract extraction. Multifocal intraocular lenses have progressive change in power over the whole surface, thus providing clear focus at various distances. This is usually accomplished by a series of rings, using the principles of refraction and diffraction to change the direction of light propagation to focus at different distances. Short-wavelength filtration intraocular lenses absorb short wavelengths (ultraviolet and blue light). They may be valuable in preventing retinal damage (e.g. age-related macular degeneration). Toric (astigmatism-correcting) intraocular lenses are designed to correct astigmatism. They need to be perfectly positioned. Syn. intraocular lens implant. See 'bag' capsular; biometry of the eye; pseudophakic eye; SRK formula; ciliary sulcus. Irlen lens See Meares-Irlen syndrome. iseikonic lens See aniseikonic lens. isochromatic lens A tinted lens which absorbs all radiations equally. Koeppe lens A diagnostic goniolens designed to be placed on the anaesthetized cornea for a direct view (without a mirror) of the angle of the anterior chamber. It consists of a high-plus (50 D) lens with a back concave surface and a flange that retains the lens in place. Like all goniolenses, its overall power more or less neutralizes the refractive power of the cornea. Its image magnification is about half that of goniolenses with mirrors but its field of view is wider. The lens is typically used with a hand-held biomicroscope, in surgery and with children in whom it can be used to examine the fundus as well. Syn. Koeppe contact lens; Koeppe gonioscopic lens. See direct gonioscopy; gonioscopic lens. lacrimal lens See liquid lens. laminated lens A lens consisting of a thin layer of plastic (e.g. cellulose acetate) cemented between two layers of glass. Such a lens protects the eye because in case of breakage the glass pieces remain attached to the plastic layer. See safety glass; safety lens. lathe-cut contact lens A contact lens in which the optic radii of the surfaces are cut into a block of plastic mounted in a lathe and then polished. Hydrophilic polymers are cut in a solid state with shorter radii and thinner centre thickness than is desired in the hydrated state, and they are polished with an oil-based compound, as water cannot be used. See cast-moulding contact lens; spin-cast contact lens. lenticular lens An ophthalmic lens with a central zone finished to prescription surrounded by a supporting margin (carrier), generally made in order to reduce the weight of lenses of high power. They can be made either as one solid piece or the power element may be cemented on a plano carrier. See aperture of a lenticular lens; aphakic lens. lens liner See lens washer. liquid lens The lens formed by the tear layer lying between the back surface of a rigid contact lens and the cornea. It must be taken into account when fitting contact lenses. If the back surface of the lens is steeper than the cornea, the liquid lens is positive and the eye is made more myopic. 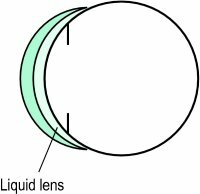 If the back surface of the lens is flatter than the cornea, the liquid lens is negative and the eye is made more hyperopic. (Fig. L14) Syn. fluid lens; lacrimal lens; tear lens. loose lens See flat lens. low water content lens A contact lens whose water content is less than 50%. luxation of the lens See luxation. magnifying lens A converging lens used to magnify an object without image inversion. Syn. magnifying glass. See magnifier. where n is the refractive index and FLM is the reading, in dioptres, shown on the lens measure (Fig. L15). Syn. lens clock; spherometer (the old models had three outer fixed prongs instead of two). See focimeter; neutralization; vertex depth. meniscus lens Lens with one spherical convex surface and the other spherical concave. Meniscus lenses often have a base of 6 D for the surface of lesser curvature. Syn. curved lens; bent lens. See base curve. meridional size lens See aniseikonic lens. microscopic lens See telescopic lens. mid-water content lens A contact lens whose water content is between 50% and 65%. minus lens See concave lens. multifocal lens A lens with various dioptric powers such as a bifocal, a trifocal, or a progressive lens. negative lens See concave lens. lens nucleus See crystalline lens. ophthalmic lens Any lens used to correct refractive errors of the eye. Sometimes it also includes lenses used to measure the refractive error. ortho-k lens A rigid gas permeable contact lens used temporarily to reshape the cornea and change its power resulting in a reduction of myopia, or hyperopia. Most ortho-k lenses for myopia are based on a reverse-geometry design in which the central portion of the posterior surface of the lens is flatter than the average normal cornea and the peripheral portion is steeper. The design is the opposite if the ametropia is hyperopia. The lens is usually worn only at night. Significant improvement occurs within a month. The process is reversible when contact lens wear ceases. See reverse-geometry lens; ortho-keratology. orthoscopic lens A lens corrected for peripheral aberrations. See Tscherning ellipse. lens paradox A hypothetical decrease in the power of the crystalline lens due to a continuum of refractive index changes in the layers of the ageing crystalline lens, such that it compensates for an increase in lens power which would otherwise occur due to an increase in lens thickness and lens curvatures (and therefore myopia). This is proposed as an explanation for the fact that the refractive state of the eye actually shifts towards hyperopia (or less myopia) with age. periscopic lens A spherical lens in which the minus lenses have base curves of +1.25 D and the plus lenses have base curves of −1.25 D. Meniscus lenses are more curved. See base curve. photochromatic lens See photo-chromic lens. photochromic lens A lens used either in sunglasses or as an ophthalmic lens. It is made up of a glass material, which changes in colour and/or in light transmission as a result of changes in incident light intensity or heat. The changes are reversible and relatively rapid. There exist several types, which are known by their trade name (e.g. Photogray Extra, Reactolite Rapide). Syn. photochromatic lens. See vignetting. piggyback lens A combination of two contact lenses; usually a rigid contact lens over a hydrogel lens. The soft lens is used for comfort and the rigid lens for best visual results. Piggyback lenses can be used after corneal surgery, corneal scarring and in the management of severe keratoconus or irregular astigmatism. Syn. combination system. See combination lens; therapeutic contact lens. plano lens See a focal lens. planoconcave lens A lens with one plane and one concave surface. planoconvex lens A lens with one plane and one convex surface. plastic lens Lens made of transparent plastic. It is approximately 50% lighter than a glass lens of equal power but more liable to scratching. Plastic lenses do not shatter like glass lenses and therefore give better protection. See CR-39; safety glass; safety lens. plus lens See convex lens. point-focal lens See best-form lens. polarizing lens A lens that transmits light waves vibrating in one direction only. In the other direction perpendicular to it, the light waves are absorbed. In this way reflected glare is reduced. Common polarizing materials include herapathite crystal, calcite crystal or a stretched sheet of polyvinyl alcohol containing iodine. See polarized light. positive lens See convex lens. posterior chamber intraocular lens See intraocular lens. prismatic lens A lens with prism power. prism ballast lens See ballast. prismatic effect of a lens See correction induced convergence; induced prism. progressive addition lens (PAL) A spectacle lens having a gradual and progressive change in power either over the whole lens or over a region intermediate between areas of uniform power. The progression is produced by a complex aspheric shape of one of the surfaces. This lens is used to correct presbyopia. (Fig. L16) Syn. varifocal lens. See interpupillary distance; gradient-index lens; multifocal lens. reading lens A lens prescribed for near vision (or a magnifying glass). reverse-geometry contact lens A contact lens in which the back optic zone radius (BOZR) is flatter than the cornea. This zone is surrounded by a mid-peripheral curve, which is steeper than the cornea (some lenses omit this reverse curve), a peripheral curve. which is aligned with the peripheral cornea, and edge clearance. This lens design can be used in orthokeratology to control myopia, in the management of keratoconus, after keratoplasty or photorefractive surgery in which the corneal front surface is flatter than normal and there is partial alignment with the BOZR (Fig. L17). See ortho-k lens; back optic zone radius. rigid lens See contact lens. lens rim artifact An apparent reduction in the extent of the visual field when perimetry is carried out with the patient's correction. The greatest reduction is usually found with the standard trial case lens. It is even more noticeable in the elderly, possibly because many of them have deep-set eyes that increase the distance from the lens to the eye. With the patient's own spectacles the artifact is less extensive. It is usually non-existent when wearing contact lenses. safety lens 1. A lens made of safety glass. 2. A general term referring to any lens that protects the eyes against injury due to impact and which is more resistant to fracture and less likely to splinter than an ordinary glass lens. Examples: plastic lenses (especially polycarbonate); toughened lenses; laminated lenses. Plastic lenses have the greatest impact resistance of all these lenses. See safety glass. scleral contact lens A contact lens that fits over both the cornea and the surrounding sclera. It is divided into an optical zone and a scleral (or haptic) zone. When made of PMMA material it includes small holes (called fenestrations) to aid tear exchange and corneal oxygenation. Modern scleral contact lenses are made of gas-permeable material and do not require fenestration. Scleral contact lenses are used mainly therapeutically for corneal protection, tear retention and pain relief in ocular surface disorders, vision improvement as in keratoconus and after penetrating keratoplasty or occasionally for theatrical and sports purposes. sealed scleral contact lens A scleral contact lens made up of gas permeable material. The optic portion of the lens has a curvature such that there is no contact between the lens and the cornea and that space (called corneal clearance) is filled with saline water forming a fluid pre-corneal reservoir. There is no tear exchange and corneal oxygenation is essentially provided through the lens matrix, as there is no fenestration. This lens is used in patients with corneal ectasia, such as keratoconus, keratoglobus and pellucid marginal degeneration, dry eyes of various aetiologies (e.g. Stevens-Johnson syndrome), etc. semi-finished lens An ophthalmic lens of which only one surface is completely polished. The other side can be surfaced to any required curvature. If it is a bifocal lens, the side with the segment is usually the one that is completely surfaced. Syn. semi-finished lens blank. See lens blank; finished lens. silicone hydrogel lens A contact lens made of elements of silicone and a hydrogel polymer to form a co-polymer that has the properties of both. A hydrogel-forming monomer such as HEMA is combined with a modified silicon-containing monomer such as TRIS (tris (trimethylsiloxy) silylpropyl methacrylate) or a derivative of TRIS. Such a lens has a high oxygen permeability, adequate wettability, good optical properties and acceptable lens movement on the eye (unlike basic silicone rubber material, which tends to adhere to the cornea). It can be used for extended wear as contact lens-induced oedema is virtually eliminated. Permeability (Dk) of such lenses exceeds 100. See therapeutic contact lens; modulus of elasticity. single-vision lens (SV) An ophthalmic lens having only one power. size lens See aniseikonic lens. slab-off lens A lens in which a portion of one surface has been ground with the same radius of curvature as the rest of the surface, but with separated centres of curvature. That portion of the lens produces a prismatic effect. Slab-off lenses are used most commonly to correct an induced vertical imbalance as, for example, in a patient with anisometropia looking through the lower part of the spectacle lenses when reading. spectacle lens Any lens used as a correction or protection and mounted a short distance from the eye, usually in a frame but also as a lorgnette, pince-nez, monocle, etc. See ophthalmic lens. lens speed See f number. spherical lens A lens in which the two surfaces are spherical. spherocylindrical lens A lens with one surface spherical and the other cylindrical. It has two different refractive powers in its two principal meridians. See astigmatic lens; cylindrical lens; toric lens. spin-cast contact lens A contact lens produced by placing a quantity of liquid mixture into a concave spinning mould with polymerization taking place during rotation. 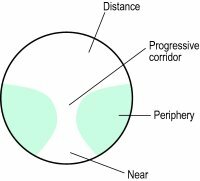 The curvature of the mould determines the front optic zone radius, whereas the speed of rotation and other factors determine the curvature of the back optic zone. See cast-moulding contact lens; lathe-cut contact lens; moulding. lens stalk See optic cup. steep lens A contact lens in which the back optic zone radius is shorter than the flattest meridian of the cornea. This definition may not be valid for a soft lens, which may fit steeply even when its back optic zone radius is not shorter than the flattest meridian of the cornea. Syn. tight lens (it is preferable to use this term for soft lenses). See limbal blanching; contact lens acute red eye; fitted on K; flat lens. stigmatic lens See anastigmatic lens. Stokes lens A lens consisting of two planocylinders of equal and opposite power mounted with their flat surfaces almost in contact with each other in a cell, and geared to rotate equally in opposite directions from a zero setting. At that setting, the two cylinder axes coincide and produce the minimum astigmatic value. When the lenses are rotated so that the two cylinder axes are at right angles to each other the lens produces the maximum astigmatic value. 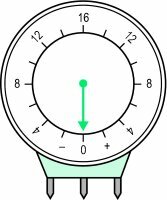 Intermediate settings of the two cylinder axes result in intermediate astigmatic values. This lens is used in some ophthalmic instruments. subluxation of the lens See luxation of the lens. lens sutures Radiating lines in the crystalline lens formed by the meeting of lens fibres. 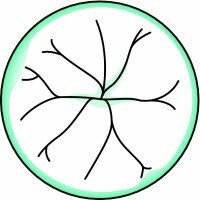 Some of these systems of lens fibres form in the fetus or infant a Y, the arms of which are separated by angles of 120º. The anterior Y is upright and the posterior one is inverted. In the adult eye the systems of lens fibres make up more complicated figures, but the Ys present at birth usually persist throughout life (Fig. L18). See lens fibres; crystalline lens. tear lens See liquid lens. telescopic lens A thick lens system forming a galilean telescope used to magnify the image. It is mounted in some form of frame and is lighter than an actual telescope. It is used to help low vision patients for either distance or near vision, although for the latter the lens system (or sometimes a single lens) is often referred to as a microscopic lens. therapeutic contact lens A contact lens, usually hydrogel, which acts as a protective device for the cornea, as in entropion, trichiasis, or damage by application of a tonometer; as a pressure bandage to relieve pain, as in bullous keratopathy; to facilitate corneal healing, as in corneal erosion due to trauma; to improve vision during the healing process; and as a delivery mechanism for drugs, since soft contact lenses placed on the eye can slowly release a drug which was previously absorbed. Silicone hydrogel lenses, which can be worn for up to one month at a time, are an efficient type of therapeutic contact lens. Gas permeable contact lenses are used therapeutically for extremely irregular corneas and some ocular surface disorders (e.g. keratoconus). Because of the risks associated with therapeutic lenses, it is important to follow the patient very assiduously. Syn. bandage lens. See Cogan's microcystic epithelial dystrophy; Thygeson's superficial punctate keratitis; combination lens; ortho-k lens; piggyback lens; scleral lens. thick lens See thin lens. lens thickness caliper See caliper. thin lens A lens or combination of lenses in which the refracting surfaces are regarded as coincident, that is in which the separation between surfaces does not appreciably alter the total power of the system. Most ophthalmic lenses are thin lenses, but the crystalline lens of the eye is considered to be a thick lens. For optical purposes contact lenses are also regarded as thick lenses. Thorpe four mirror fundus lens See slit-lamp. tight lens See steep lens. tinted lens An absorptive lens having a noticeable colour and absorbing certain radiations more than others. See bleaching; absorptive lens; cosmetic contact lens; photophobia; sunglasses; transmission curve. toric lens This is usually a meniscus-type lens with a toroidal convex or concave surface. A toroidal surface is a surface with meridians of least and greatest curvature located at right angles to each other. See astigmatic lens; meniscus lens; spherocylindrical lens. toughened lens A lens made of glass that has been either thermally or chemically strengthened. See safety glass; safety lens. trial lens 1. A lens used in a trial case. 2. A trial contact lens. trifocal lens A multifocal lens consisting of three portions of different focal power usually for distance, intermediate and near vision (Fig. L19). See intermediate portion. uncut lens See finished lens. varifocal lens See progressive lens. ventilated lens See fenestrated lens. lens washer A plastic material which may be inserted between a loose lens and the eyewire of a frame to make the lens fit into the frame more securely. Syn lens liner. wide-angle lens A lens giving good resolution over a wide field of view, usually used in better quality cameras. See fisheye lens. Wilson three mirror fundus lens See slit-lamp. Wollaston lens Lens based on the values provided by Wollaston of the Tscherning ellipse. See Tscherning ellipse. X-Chrom lens Trade name for a dyed hard corneal contact lens aimed at enhancing colour perception in red-green deficient people. It is usually fitted on the non-dominant eye. The lens has maximum transmission above 575 nm with some additional transmission below 480 nm. Wearing this lens shifts the original absorption spectrum of the eye with the contact lens towards longer wavelengths. Objects may thus appear slightly different than with the other eye. This difference between the two eyes may, in certain conditions, improve colour discrimination. See ChromaGen lens. Zeiss lens A type of goniolens, which when placed over the eye allows viewing of the anterior chamber angle. The Zeiss lens differs from other goniolenses in so much that it contains four mirrors, allowing visualization of the entire anterior chamber angle without the need to rotate the lens. See indirect gonioscopy; gonioscopic lens. zoom lens A lens in which the components can be adjusted to provide continuously variable magnification while the image remains constantly in focus. includes L. culinaris, L. esculenta. See ervum. Q. My neighbor's kid had a lens dislocation due to Marfan's disease. Is this a contagious thing? My neighbor's have a sweet 8 year old boy. he had a lens dislocation due to a connective tissue disease named Marfan (I think that the name). It sounds like a very serious condition. My boy is playing with this kid several hour a week. should I take him to the GP to see that his is not infected with this marfan thing? A. As in love and war so is in medicine the is no always nor never. It is probably the marfan that caused your neighbor kid the lens dislocation but you can never know for sure. If you want there is nothing wrong in taking your boy for an annual check of an ophthalmologist.